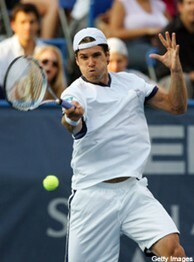 Tommy Haas received a wild card into the Atlanta Tennis Championships. ATLANTA – Tommy Haas, the former world No. 2-ranked player, has been granted a wild card into the Atlanta Tennis Championships, an ATP World Tour event that kicks of the Olympus US Open Series to be played at the Racquet Club of the South from July 18-24, it was announced by Tournament Director Bob Bryant. The 33-year-old holds 12 ATP World Tour singles titles dating back to 1999, where he won his first in Memphis. In addition, he was the silver medalist at the 2000 Olympic Games in Sydney and has reached the semifinals at four Grand Slams. He has been sidelined the past year after hip surgery but returned to the courts at the French Open. "I am glad to be back playing the game I love," said Haas, a Bradenton, Fla., resident. "I am excited to come to the Atlanta Tennis Championships, believe that I am returning to championship form, and am excited to play in front of the great fans in Atlanta." Haas joins an impressive field featuring top 10-ranked American Mardy Fish, former University of Georgia All-American John Isner, international stars Milos Raonic and Lleyton Hewitt, and a host of other talented stars, like James Blake, Ryan Sweeting, Kevin Anderson and Kei Nishikori. In addition to the singles field, the initial doubles entry list pairs Isner and Blake as a marquee team that fans will want to see. Also pairing up are rising star Grigor Dimitrov and Sweeting and Asians Nishikori and Yen-Tsun Lu. "We are thrilled to grant former world No. 2 Tommy Haas a wild card into the Atlanta Tennis Championships," said Bryant. "He is a seasoned veteran who has had an impressive career. We know our fans will enjoy watching him and other world-class professionals at our tournament, which begins in less than two weeks." For more information about the Atlanta Tennis Championships and tickets, call 678-495-3279, e-mail tickets@atlantatennischampionships.com or visit www.atlantatennischampionships.com. The Atlanta Tennis Championships will be played at the Racquet Club of the South, 6350 Courtside Drive, Norcross, GA 30092, July 18-24. The facility hosted the 1990 Fed Cup final and a men’s World Championship Tennis tournament in the 1980s. A USTA Regional Training Center, the facility is the home club of one of the top American players, Melanie Oudin, of Marietta, Ga. In 2010 top competitors included Andy Roddick, Lleyton Hewitt, James Blake and Robby Ginepri, of Kennesaw, Ga. More than 41,000 spectators attended the inaugural tournament that offered $600,000 in prize money. The ATP formally awarded the ATP 250 sanction Atlanta Tennis Championships to the USTA Southern Section in December 2009. For ATC ticket information, call 678-495-3279, e-mail tickets@atlantatennischampionships.com or visit www.atlantatennischampionships.com. The ATP is the governing body of the men's professional tennis circuits - the ATP World Tour, the ATP Challenger Tour and the ATP Champions Tour. With 62 tournaments in 32 countries, the ATP World Tour showcases the finest male athletes competing in the world’s most exciting venues. From Australia to Europe and the Americas to Asia, the stars of the ATP World Tour battle for prestigious titles and South African Airways 2011 ATP Rankings points at Grand Slams (non ATP events), ATP World Tour Masters 1000, ATP World Tour 500 and ATP World Tour 250 events. At the end of the season only the world’s top 8 ranked men’s singles players and top 8 doubles teams, based on their performance throughout the year, will qualify to compete for the last title of the season at the Barclays ATP World Tour Finals. Held at The O2 in London, the event will officially crown the 2011 ATP World Tour No.1 in singles and doubles. For more information, please visit www.ATPWorldTour.com.